- Lower Recidivism - the rate of re-offences by serious habitual juvenile offenders has dropped dramatically in Muskegon County. - Cost Savings - community based treatment in lieu of out-of-home placement has resulted in significant savings in the County's Child Care Fund. The following diagram models the SHOnet application developed for Muskegon, Michigan that has been successful in sharing information and expanding local capacity for treatment services. In the model above public agencies collaborate with community service providers in the case management of juveniles assigned to SHOCAP by the courts. The treatment collaboration requires sharing information relevant to the court-ordered terms of probation for a youth through an Internet based software application called Muskegon SHOnet. 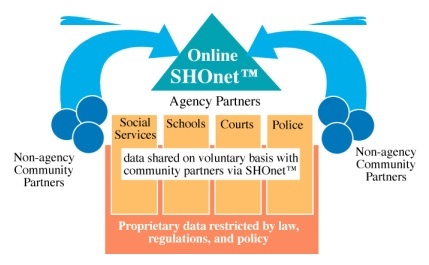 The web-based SHOnet provides real time information to facilitate the intensive supervision of the youth with immediate intervention when necessary. SHOnet also provides all the partners with reports on the outcomes of the community based treatment by tracking contact services and recidivism. Of the 41 youth enrolled in the Muskegon SHOnet program, collectively they had 361 prior charges for offenses and were classified as serious habitual offenders and public safety threats to the community. While participating in the SHOnet program, this same group had only 91 new offenses. While the data did not differentiate between felony and misdemeanors, the Family Court staff believed that none of the new offenses were felonies. Of the 41 youth participating, a total of 14 had zero new offenses while in SHOnet. A total of 35 youth had less than 5 new offense during their SHOnet involvement. The average length of enrollment in SHOnet was 17.3 months. The policy of the SHOCAP program currently restricts the participation to those under the age of 18. The average age for enrollment into the SHOnet program was 14.6 years. The average age for first contact with the Court for a SHOnet youth was 11.8 years. The youngest ages for first offenses were ages 7 and 8. Of the 41 youth over the course of four years, 20 received some level of short-term placement as a graduated sanction. Generally these were 3 to 6 month placements used to clean up the bad habits at the start of the program. Collectively, the ten youth who where in the program during the first fourteen months of the program had 51 convictions prior to being placed in the SHOnet program. Their offenses were of a large variety with examples such as breaking and entering, torturing an animal, home invasion 2nd, assault and battery, operating a vehicle under the influence/causing serious injury, explosive possession of a Molotov cocktail and drug related offenses. Altogether they had 35 probation violations prior to being placed in the program and had spent 1240 days in detention or residential placement. One youth was unsuccessfully discharged from the program. Another youth had one MIP charge. Collectively they 14 enrolled youth had 30 probation violations. During the first year, they had collectively spent 400 days in detention or residential placement. Without SHOnet as an option these youth would have been placed in detention or residential placement.The County estimates that they would have spent approximately 2250 days in detention or residential placement during the last fourteen months. The cost of those placements vary anywhere from $150.00/day to $350.00/day. They calculate the cost of the facilities that would have been used to be approximately $170.00/day. Placing these youth in detention or residential placement would have cost approximately $382,500.00. The actually expenditures were $68,000.00 on the placement while they were in the program. Therefore, the county saved approximately $314,500.00 in fourteen months on these youth.